There’s no denying it; Halloween decorations can get a little grotesque. Whatever the case, once the days start to get shorter and October approaches, you can bet that monsters and mayhem are going to take their rightful holiday-places as the centerpiece of home decor. But why stop with basic decorations? If you really want to get into the Halloween spirit, you to let the Halloween spirit get into you. How can you do that? 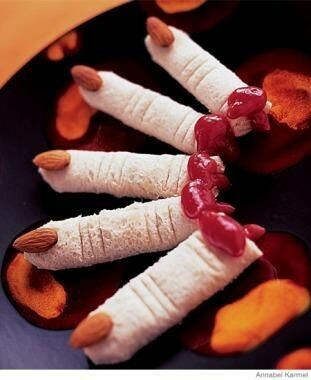 Well, by trying these amazingly gross-looking (yet great-tasting) Halloween-themed foods. Annabel over at Annabelkarmel.com has developed a killer recipe that may be the perfect finger-food. Use a rolling-pin to flatten the slices of bread. This will make them more malleable. Spread margarine and cream cheese or peanut butter on one side of the flattened bread. Roll up the bread so that the margarine and cream cheese or peanut butter are on the inside. Use the blunt edge of a butter knife to make indentations along the length of the “fingers” where the finger-joints would be. Use a squirt of ketchup or a dab of strawberry jam on the non-fingertip end of the sandwich to give the appearance of a bloody stump. These sandwiches are just gross-looking enough to be fun to eat, without being so gross-looking that they kill your appetite. And, when paired with some fruit and vegetables, they can even become a quick and easy meal. This recipe comes to us from the food-geniuses at Marthastewert.com. Over medium-low heat, melt the butter in a large saucepan. Add the onion and garlic, and cook until the onion becomes translucent. Add the wine, and allow it to cook until most of the liquid has evaporated. Add the tomatoes, chicken stock, and oregano, and then bring to boil. Reduce heat and then simmer gently until the soup has thickened. This should take about 45 minutes. Use a slotted-spoon to remove the herbs. Use a blender to puree the soup in small batches until it becomes smooth. Return the soup to the pan and slowly pour in the half and half while stirring. Add salt and pepper to taste. Create the “eyeballs” by using a melon baller to scoop out the center of each bocconcini. Cut each pimento-stuffed olive crosswise, and place one half, with the cut side facing outward, in the hole of each bocconcini. This will give the overall appearance of an iris and a pupil. Ladle the hot soup into shallow bowls, and float a few “eyes” in each bowl of soup. 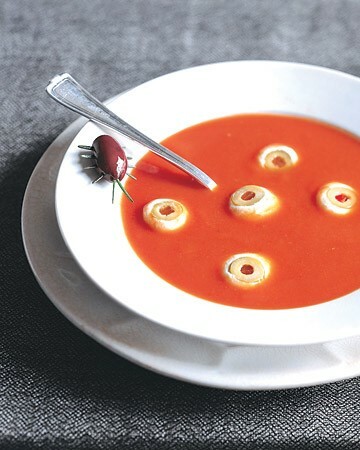 Once the weather starts to turn colder, few things hit the spot quite like a warm bowl of tomato soup. And, if it contains delicious mozzarella balls that also happen to look like staring eye-balls, then so much the better. Here’s another fun recipe from Marthastewert.com. Cut the hot dogs lengthwise into 1/2 -inch-thick strips. Over high heat, bring a large pot of water to boil. Reduce heat, and then add the hot dogs. Allow them to cook until they begin curl. remove from heat and then drain. 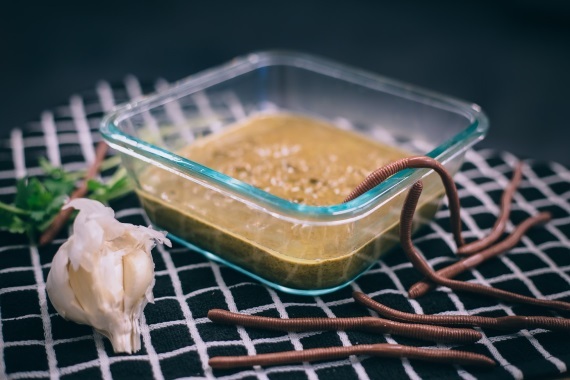 Not all Halloween-themed foods need to be gruesome or gory; this dish mimics the look of creepy-crawly worms in mushy brown soil, which should have kids squirming in excitement. Celeste over at Sugarandspice-celeste.blogspot brings us this version of an amazingly decadent party recipe. Combine the cream and butter in a heavy saucepan over medium heat. Once the cream and butter have warmed, add the chocolate chips, stirring constantly until smooth. Add food coloring several drops at a time until fondue becomes the desired shade of red. Transfer the fondue chocolate to a serving bowl. Arrange strawberries, sponge cake, grapes, and pretzels in serving dishes. Have guests dip the strawberries, sponge cake, grapes and pretzels into the blood-red chocolate mixture, for a fun dessert that’s absolutely to die for! 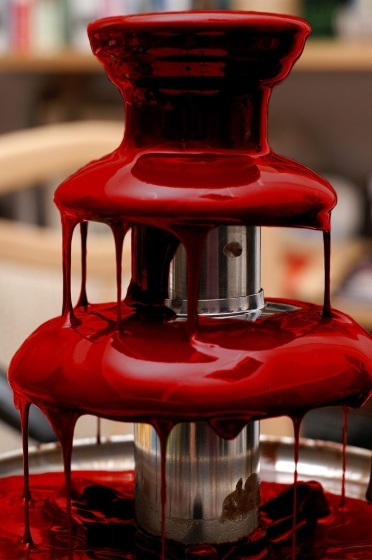 This recipe works especially well if you have access to a fondue fountain, because the constantly dripping and flowing red chocolate somehow looks even more blood-like when it’s in motion. 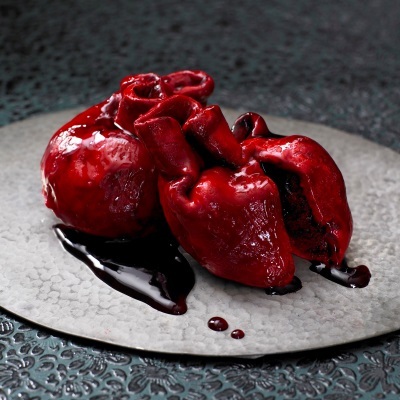 Lily Vanilli, writing for Blogs.independent, has developed this beautifully blood-soaked dish to help put a chill in your Halloween get-together. Sandwich the layers from the cooled Red Velvet layer cake together using the frosting. Cut the cake into an oval shape. Roll your fondant to around ¾ inch thickness, to a flat oval shape around 2.5 times the size of your cake. Place the cake in the centre of the fondant and use frosting to stick it into place. Wrap the fondant around the cake from both the edges, folding inwards to the front of the cake, then fold in the bottom. Cut away any excess. Use the extra fondant at the top to form the arteries (you may want to have a picture of a real heart on hand to use as a reference). Don’t worry about any creases or gathering in the fondant—they make for useful gory details later on. Allow the heart cake to sit at room temperature until the fondant becomes firm. In a small bowl, mix a spoonful of the clear piping gel with some drops of red (and black, if you like) food colouring. Now paint the fondant heart all over using a soft brush. This will give the heart a glossy, wet look. Before serving, use a pipette or spoon to add coulis or jam ‘blood’ to the arteries and in a puddle around the base. Perfect for Halloween (and maybe even Valentine’s day), this messy delight is quick to make and fun to eat... just remember to wear a bib. Divinedinnerparty.com has come up with a recipe for a dip that tastes so good it will make your stomach growl (if you’re not already heaving at the name). Crumble toast into fine crumbs. In a blender, combine walnuts, garlic, and crumbs. Blend until finely ground. Add lemon, oil, and parsley. Process until smooth. Add water as needed until desired consistency. Allow completed mixture to sit in the refrigerator for at least a few hours. This will cause the mixture to darken slightly (giving it a more disgusting appearance). Serve in a bowl labeled “Cockroach Puree,” with chips or bread for dipping. The crunchy walnuts will give everyone cause to wonder if you’ve actually gone ahead and included cockroaches in your recipe, but the dip tastes so good, they won’t even care! 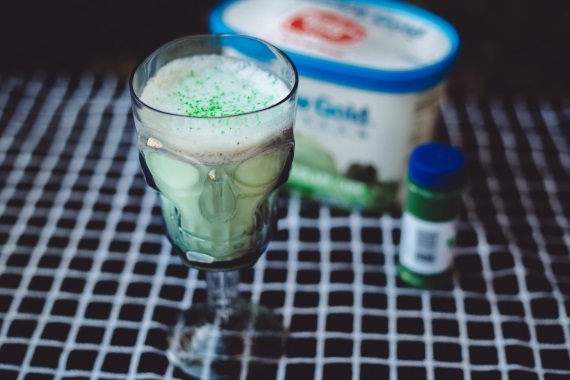 This refreshingly simply drink recipe comes to us courtesy of Grosshalloweenrecipes.com, and is great for ghouls of all ages. Put the ice cream and milk together in a blender. Blend until creamy. Serve topped with green sprinkles. This particular beverage can be made at a moment’s notice, and can be enjoyed by both kids and adults. For a more intense color, add a drop or two of green food coloring. 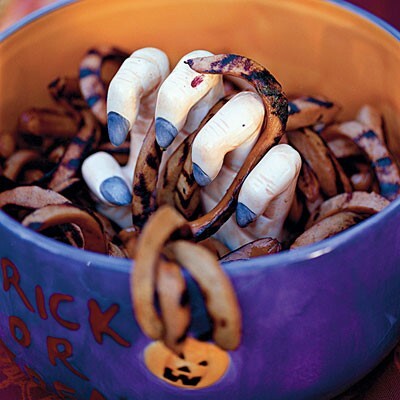 Are there any amazingly disgusting edible Halloween decorations that we missed? Share the horror dropping them into our comment section.